By the time that dinnertime rolled around last night, my family had heard enough out of me. That morning, I had sautéd some onions with a mixture of fresh ginger, garlic, and spices, added some tomatoes and combined this mixture with some chickpeas (garbanzo beans) in my crockpot. By lunchtime, my house smelled as good as frying bacon on a Sunday morning (my apologies to any vegetarians who might be reading this – please just try to imagine the smell of simmering gingered chickpeas). Much to my family’s exasperation, I continuously inhaled deeply and exclaimed, “That smells SO good!” throughout the rest of the day. Their torture only got worse at dinnertime. With each bite, I let out an audible groan of satisfaction. Their eye-rolling became less subtle as the meal progressed. This vegetarian stew has a lot going for it. Besides the ethereal smell and taste of this dish, it is dead simple to make. 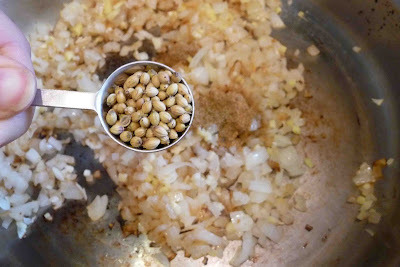 Sauté some onions and spices, toss them with some chickpeas, and let the crockpot do the rest of the work. From the Family Crockpot Applesauce to the Crockpot Chicken, Black Bean and Chipotle Soup, my hard-working slow cooker has earned its keep over the past couple of weeks. Heat 1 tablespoon olive oil in a large skillet over medium heat. 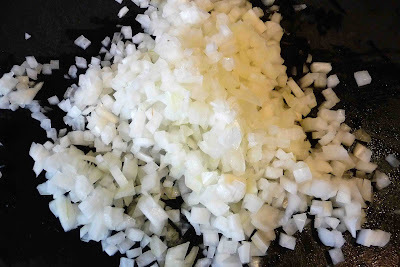 Add 2 finely chopped onions and cook, stirring, until the onions begin to brown. Add 4 finely chopped garlic cloves, 2 tablespoons minced fresh ginger, 2 teaspoons ground coriander, 1 teaspoon coriander seeds, 1 teaspoon salt, and 1/2 teaspoon freshly ground black pepper. Cook, stirring, for 1 minute. Add 2 teaspoons balsamic vinegar and 2 cups coarsely chopped canned or fresh tomatoes. Bring the mixture to a boil. Rinse and drain 2 cans (15 oz each) of chickpeas or cook and drain 2 cups dried chickpeas. Spread the chickpeas in the bottom of a crockpot (slow cooker). 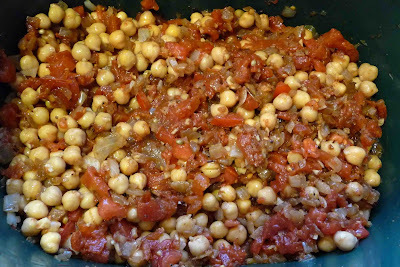 Pour the tomato mixture over the chickpeas and stir well. Cover the crockpot and cook on Low for 6 to 8 hours or on High for 3 to 4 hours. Just before serving, stir in 2 cups (packed) fresh spinach leaves. You could use any leafy green that appeals to you, such as Swiss chard or kale. Serve as a side dish or over rice as an entrée. The flavors are fantastic in this vegetarian entree! Heat olive oil in a large skillet over medium heat. Add onions and cook, stirring, until the onions begin to brown. Add garlic cloves, ginger, ground coriander, coriander seeds, salt, and pepper. Cook, stirring, for 1 minute. Add balsamic vinegar and tomatoes. Bring the mixture to a boil. Spread the chickpeas in the bottom of a crockpot (slow cooker). Pour the tomato mixture over the chickpeas and stir well. Cover the crockpot and cook on Low for 6 to 8 hours or on High for 3 to 4 hours. Just before serving, stir in spinach. You could use any leafy green that appeals to you, such as Swiss chard or kale. Serve as a side dish or over rice as an entrée. What a totally healthy meal very nice thank you! Now I can smell it too :o) – it's amazing that after that many hours of crockpot cooking, the chick peas are still nice and round, not mushy. I don't have a crock pot, maybe time to get one! Funny story, I can just picture the dinner! Besides I think vegetarian is the way to go, I was reading some article at the doctor's office this morning, and it seems like mercury in fish and seafood is doing a lot of damages. This sounds so great, but why so much sugar? Is there anything I could leave out to eliminate the sugar content? Hi Dottie, I apologize for the confusion. I recently started using a new recipe card tool that threw the nutritional information on some of my recipes out of whack. This is one of the recipes that got lost in the shuffle. I edited the nutritional information (now correct!) and you’ll see that the sugar content is far lower than what was originally printed. 🙂 I hope you enjoy the recipe. This dish looks so delicious. I love chick peas. I always cook it in pressure cooker. I like it soft and yet still remains whole. How do you cook dried chick peas in a pressure cooker? 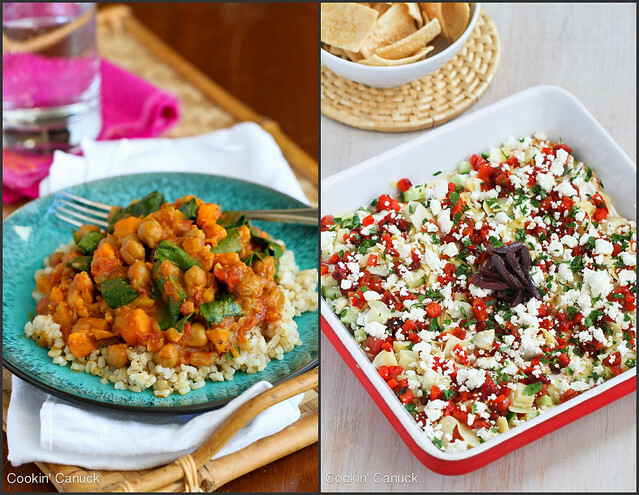 I am missing out on chickpea dishes. ughhh…. This looks really good. This looks good. Now I'm kicking myself for not getting those cans of chickpeas from when went grocery shopping. This means I have to go back. This does sound just fantastic. I can see why you would want to keep talking about it! I love my crockpot (or slow cooker as i call it) and am always on the hunt for new recipes, particularly side dishes. I think this would fit the bill well. Thanks. What a tasty & healthy meal this is!! This looks great. 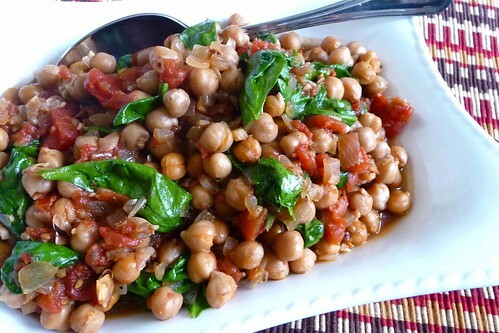 I love chickpeas and the slow cooker makes a huge difference although I haven't tried it yet. Your blog is looking good as well. A beautiful, luscious vegetarian meal. Yum! I can smell it from here! This looks absolutely amazing and I can almost smell the flavors. Will save this recipe and give it a try. And healthy – you can't beat that. Citronetvanille, the chickpeas really do hold their shape well in this recipe. If they were mushy, I wouldn't find this appealing at all. MaryMoh, I don't have a pressure cooker, but it sounds like a quick, easy way to cook chickpeas. Kalyn, I had the leftovers for lunch yesterday, so I was STILL talking about it. DivinaPe, thanks for the comments about the blog. I have been having fun playing around with the look. My husband rolls his eyes when I spend days talking about a certain dish…it's funny! This looks wonderful and healthy. While chickpeas seem to not like me as much as I like them, I might have to give them another go! Yum! That looks wonderful, I love vegetarian recipes for the crockpot. 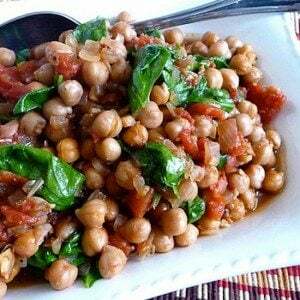 The chickpea stew looks excellent, wonderful flavors with ginger! now I know what I am going to do with the two cans of chickpeas I have in my pantry. This looks wonderful! I've been looking for a good recipe to use garbanzo beans! This fits the bill, it looks so hearty and flavorful! Mmm I love crockpot recipes! This looks delicious! congrats on Foodbuzz today this dish is on the Top 9!!! I love it when you can tell how good a dish will be by the aroma that fills your house. This looks delicious, and I love the added spinach. I have been looking for interesting slow cooker meals. This sounds and looks amazing! It's going on my "must make" list. Sounds delicious! I have actually been looking for a crockpot chickpea recipe and this totally fits the bill. CONGRATS on making Foodbuzz top 9! High Five! I actually made this recipe. It was delicious as advertised. The family also loved it. We got one dinner and several lunches from this quantity. We served it over brown rice. It is going in the permanent recipe collection. Easy, fast delicious. great post! i love c-peas. Do you have any suggestions for what meat to use if one didn’t want it vegetarian? This sounds fantastic! I’m going to make it today. Loved the description and how it made the house smell good. I made this on the stove (as I wanted it quick) & used frozen tomatoes & thin slices of green peppers (they were already frozen together). After simmering for a bout an hour I mashed the chickpeas with a fork & served with pieces of naan & crackers as a snack. My husband who doesn’t care for a lot of different foods loved it! This recipe is soooo good! Making it for the third time right now. One quibble is about prep time: 10 minutes?? It just took me 45 minutes to prep a double batch (just barely squeezes into my crockpot). Prep time should be at least 20 minutes. So good! This is going to be a staple in my kitchen! Incredibly filling, wonderfully flavorful, and best of all very low cal! Love it! This is very nice recipe blog. I like your way of presentation recipes which makes it easy for us to try this. Thanks for sharing. I would love to share this yummy recipe on networking sites also.